Women in Kakamega and Busia counties of Western Kenya are going against the grain. 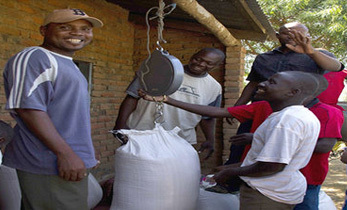 They are turning their backs on the commonly planted grains of sorghum and maize and on commercial sugarcane, and replacing them with a grain that not only better meets the nutritional needs of the family but also fulfils economic and agronomic requirements in a time of climate change. The women are planting finger millet. Finger millet hardly needs an introduction in Western Kenya. The crop is native to the highlands of Kenya, Uganda and Ethiopia and has been widely grown traditionally in Eastern and Southern Africa and South Asia for hundreds of years. It is now considered a minor crop in many of these areas. But perhaps not for long, according to the women who grow it and a woman who works to improve it. During the first two decades after Kenya’s independence in 1963, the Kenyan government singled out maize as a major food staple and started providing incentives to farmers to plant it. 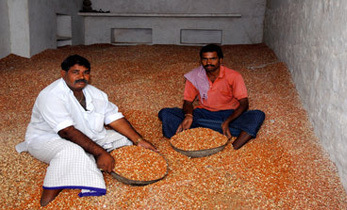 The farmers followed the government’s advice and soon finger millet became a minor crop. Damaris, a plant geneticist and the daughter of a sugarcane grower, is now leading an effort to bring finger millet back. 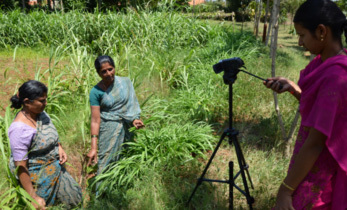 She is leading a finger millet pre-breeding project which aims to re-introduce genetic diversity into the cultivated crop which has been lost from its wild relatives. That should get more farmers to grow it. 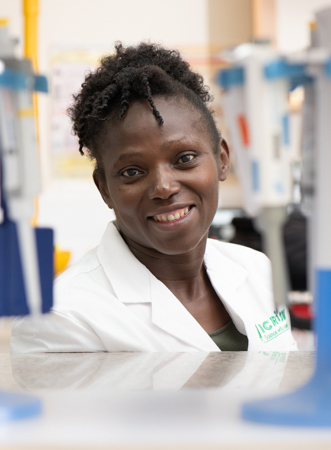 Damaris is working closely with Dr. Chrispus Oduori, a finger millet breeder and the director of the Kisii Centre of Food Crops Research Institute (FCRI) of KALRO, the Kenya Agricultural and Livestock Research Organisation. Like Damaris, Chris hails from Western Kenya and has spent a lifetime advocating for finger millet. A decade ago, Chris began working with farmers in Western Kenya to introduce modern agricultural techniques for the traditional crop and to breed improved varieties. Many of the participants in Chris’s demonstrations and attendees at his field days were women who quickly saw the many benefits of growing a crop their parents and grandparents had abandoned. 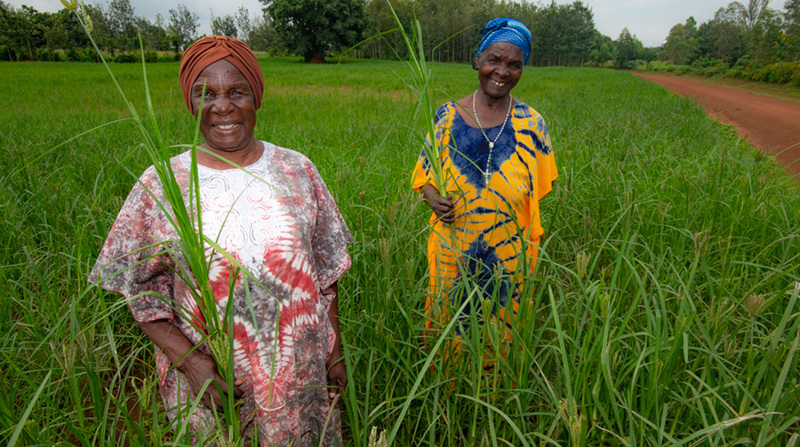 Today, those women are perhaps the greatest advocates for finger millet in the country. Mary Kwena and Mary Kwena were until recently married to the same man, which in itself is not particularly unusual in Kenya where polygamy is traditional and legal. Their husband passed away a few years ago, but the two widows with the same name remained together to better provide for their extended family. Their story is common in Kenya, where the number of female-headed households is rising. The Marys were growing maize until Chris visited in 2009 and introduced them to improved technologies to grow finger millet. Like many rural women, the Marys were early adopters and Mary One, by virtue of seniority in marriage, planted two acres of finger millet as part of a project that Chris and his colleagues at KALRO were leading. The project ended some years ago but the Marys have continued growing finger millet. “Dr. Oduori taught us how to grow finger millet in modern ways using improved varieties and we have been adding more acres every year,” Mary One said. “Traditionally, farmers would sow seed by broadcasting by hand,” Chris said. “We now teach farmers to plant in rows, which makes fertilizer use and weeding easier.” KALRO also showed the farmers that a small investment in fertilizer will yield good returns at harvest. Perhaps most importantly, Chris brought improved varieties. 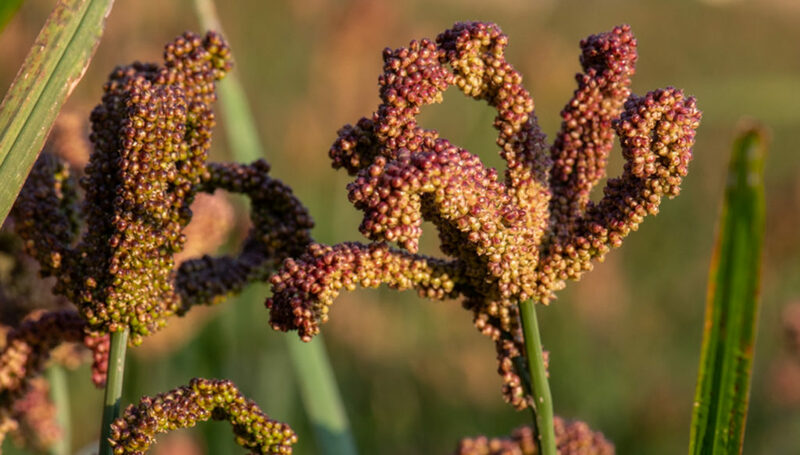 The finger millet breeder has released a number of improved varieties, but none are as popular with farmers as Maridadi, which is tolerant, though not resistant, to blast disease and the Strigaparasite. Chris’s improved varieties and agronomic techniques are giving yields up to 200% higher than what farmers once obtained. 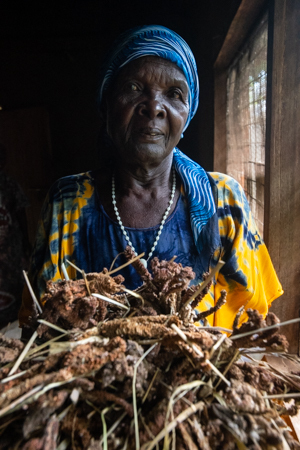 Mary Two held up some freshly harvested finger millet in her storeroom. “I don’t have to rush off to the market with this,” she said. “Finger millet stores very well.” Stored finger millet is seldom attacked by insects or molds. It can be kept for up to 10 years unthreshed. Some sources report a storage duration up to 50 years under good storage conditions. The long storage capacity makes finger millet a good option for poor farming communities keen to minimize risk during times of famine. It’s the finger millet on the plate which attracted another farmer of Kakamega County. Finger millet is a very healthy food, a fact that farmer Margaret Kubende learned 25 years ago the hard way. Finger millet is a great source of amino acids like methionine and tryptophan, which aren’t found in the diet of most Kenyans who eat maize or sorghum-based ugali. But the nutritional value of finger millet goes well beyond supplying missing amino acids. It has high iron content, which makes it an important food for pregnant women, as well as for breastfeeding mothers and their children. It is also good for people who suffer from anemia, helping to raise hemoglobin levels. Finger millet contains 40 times more calcium than maize and rice, and 10 times more than other cereals. Calcium is important in the development of strong bones. It helps to fight degenerative diseases and also works as an anti-ageing agent. For diabetics like Margaret, finger millet is gluten free and beneficial as its digestion is slow due to its high fiber content. Glucose is released slowly into the blood as a result. This helps in controlling blood sugar. Margaret and most Kenyans eat finger millet primarily as ugali, a thin porridge. But farmer Pascilisa Wanyonyi is working to create other finger millet food products and is marketing a snack called “crackies” after being trained on Chris’s project. Pascilisa wanted to go beyond the traditional uses of finger millet and create value-added processed products than can be sustainably produced. After some experimentation in the kitchen, she adopted “crackies” from the diverse products she was exposed to. Crackies are deep-fried crispy noodles made primarily of finger millet but supplemented with soy and wheat flour. “Crackies is a very nutritious snack. The children love them,” Pascilisa said. In fact, a very important Kenyan loves them as well: in April of 2018 Pascilisa served her crackies to Kenyan President Uhuru Kenyatta, who campaigned on a platform that no Kenyan should ever go hungry. Pascilisa has developed packaging and branding for her crackies ,which is generating some extra income for her family. Her daughter is attending university and studying agriculture, and finger millet in particular. 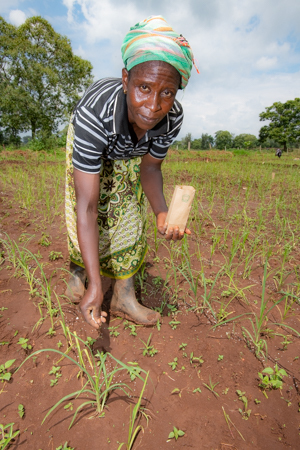 As demand for Pascilisa’s crackies grows, she looks toward growing more finger millet. But will she be able to? Farmers like Pascilisa have developed value-added processed products and that has helped to increase the demand for finger millet. 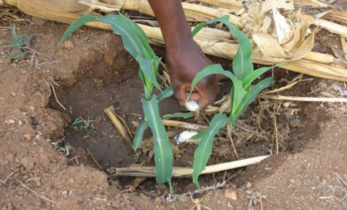 However, supply isn’t keeping pace as there remain a few barriers to overcome before more farmers plant finger millet. 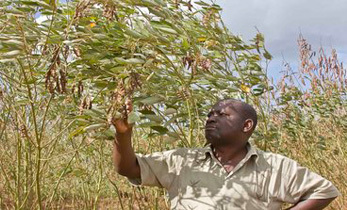 Most finger millet varieties are susceptible to blast disease, which can infect the crop at any stage of growth from the seedling to the grain formation stage, and Striga, which is a sap-sucking parasite. 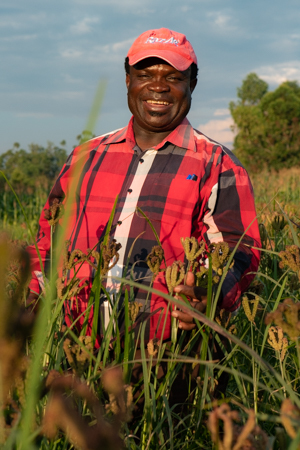 “Our improved varieties like Maridadi are less vulnerable to blast and Striga, but they are not fully resistant yet,” said Chris. Chris hopes that losses due to blast and Striga can be minimized by finding wild relatives of finger millet that have resistance to them. 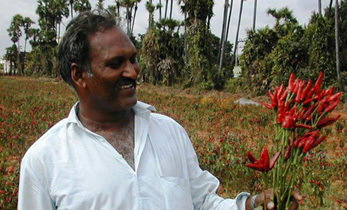 In fact, he is one of the investigators in a project which is utilizing the wild cousins of finger millet to that end. This effort is funded by the Crop Wild Relatives (CWR) initiative, a global, 10-year project, supported by the Government of Norway. The initiative is managed by the Crop Trust, an international non-profit organization, in partnership with the Millennium Seed Bank, Kew. 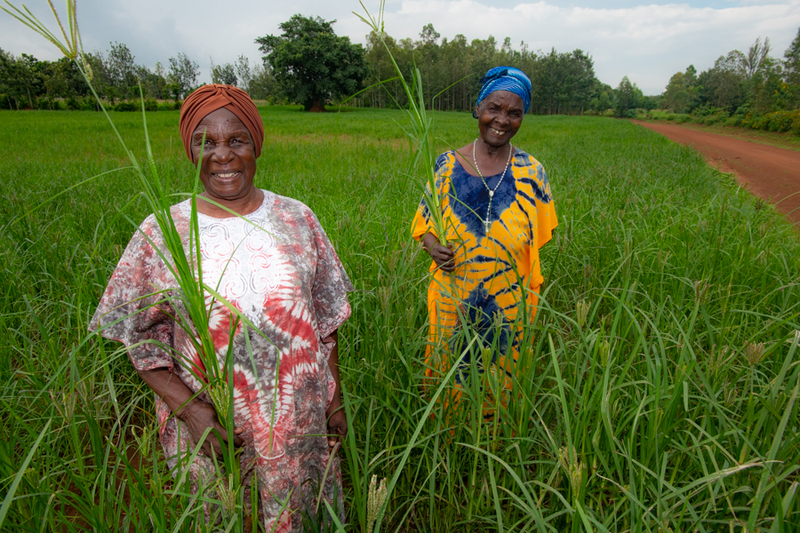 The two Marys, Margaret, and Pascilisa need no convincing about the merits of finger millet and no doubt they are eagerly awaiting the material generated by the Crop Wild Relatives project and will continue to be strong advocates of the crop. The women finger millet advocates of Western Kenya hope that their efforts to go against the grain will benefit not only fellow Kenyan families but also farmers throughout the world where finger millet can be grown as a sustainable, nutritious crop.